Inspect corn on the cob and remove a few outer leaves and as much silk as possible without completely removing husk. Wash and place on baking sheet. Loosely cover corn with aluminum foil. Bake on the middle rack in a preheated 375-degree oven for 45 to 55 minutes. Once corn is roasted, remove from oven and allow corn to cool. Peel ears, removing all silk. If desired, place ears over an open flame (grill or gas stove). Turn often, until somewhat colored. Cool completely and cut kernels from ear. Corn should measure at least 2 1/2 cups. 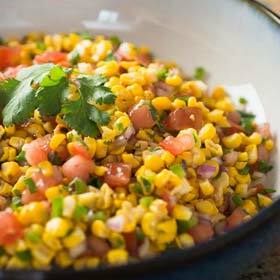 Combine corn with chopped onion, tomato, jalapeño pepper and cilantro. Add lime juice and cumin to taste; then stir in salt and ground pepper. Cover and chill, allowing flavor to blend for about 15 minutes or more. This recipe may be made in advance but is best served the same day. Serving size: 1/4 of recipe. Amount per serving: 204 calories, 6.6g total fat (1.5g saturated fat), 31g carbohydrates, 6g protein, 8g dietary fiber, 88mg sodium.